This passage is from the symphony’s opening minutes, and shows Burgess eager to display his prowess in orchestral writing. Although some of the scampering passages are a bit muddy in their execution, there is also a palpable enthusiasm—or anxiety?—for the challenges Burgess is throwing the musicians. Just before this passage there is a grand pause, into which a French hornist accidentally stumbles. This gloriously human error brings me great joy. We have all been there. Not all the blue-jeaned musicians were exactly kids. The bass section included Laird Addis, who had received his bachelors and Ph.D. degrees from UI and was serving as a philosophy professor. (In addition to his forty-year tenure as a UI faculty member, Laird spent decades playing in the Quad City Symphony and cofounded the Iowa City Community String Orchestra. His passing in 2018 is keenly felt.) The violin section was helped by the presence of Candace Wiebener, another UI alumna who was by then already serving as City High School’s Director of Orchestras. (She retired in 2012 and is active in the local music scene; she also plays in the Iowa City Community String Orchestra.) Googling the names of other musicians from the program produces a vivid illustration of what happens to young musicians who train intensively together and then disperse across the country: they teach, perform, and grow musical communities. 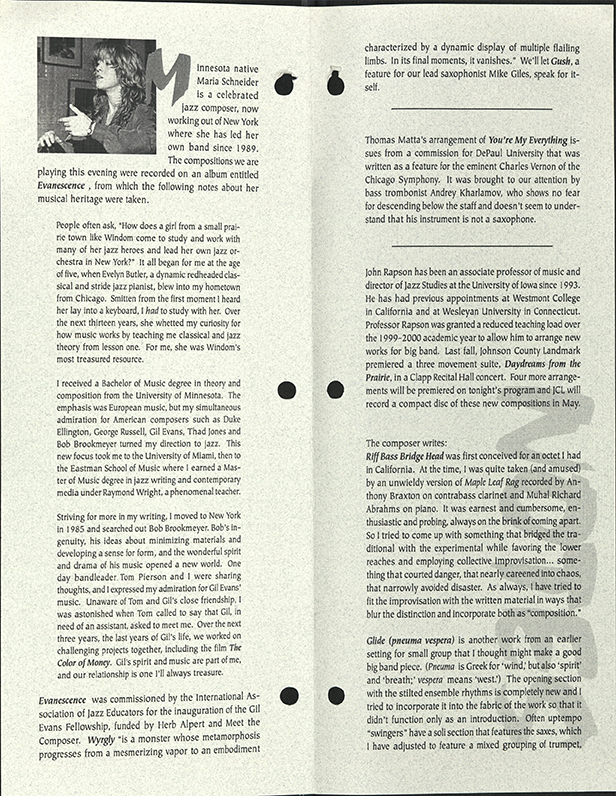 In his program note, Burgess writes that “Symphony in C is ‘English’ in the way that the music of Holst, Vaughan Williams, and William Walton is ‘English’; it exemplifies the truth that a writer of words can to some extent disguise his cultural origins, but a spinner of notes never.” His point is convincingly supported here. 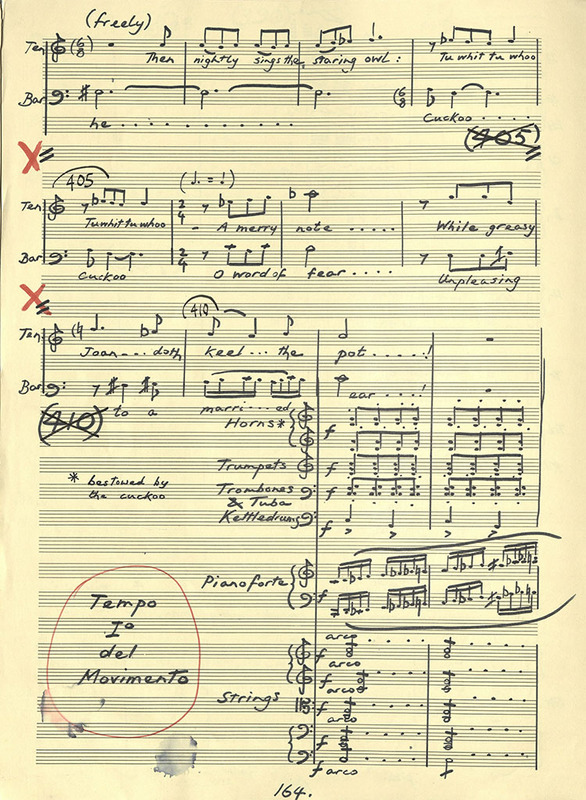 In his program note, Burgess dedicated the contemplative third movement to the memory of Dmitri Shostakovich, who had passed away a mere two months before the symphony’s premiere. This passage manages dramatic contrasts in performing forces: after the full orchestra voices the movement’s meditative central theme, solos from the orchestra’s principle players (and one impish pianist) cultivate a more intimate soundscape. 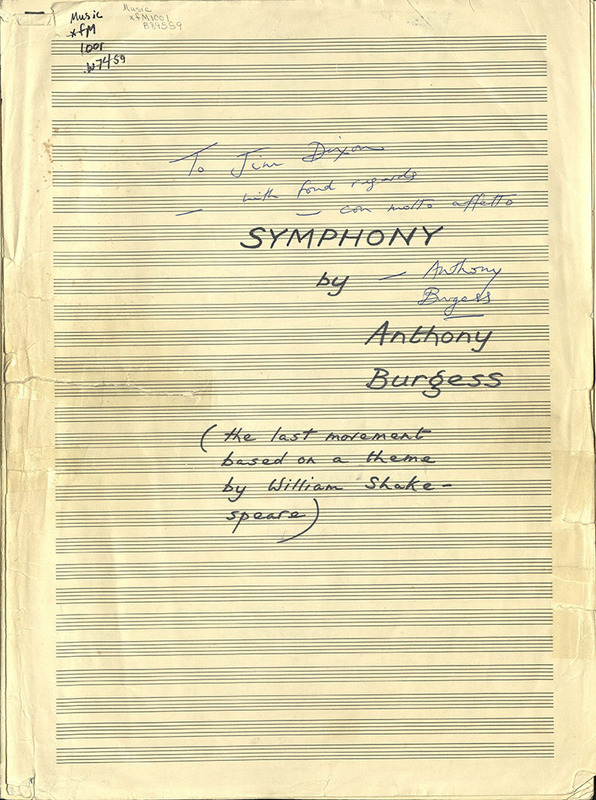 Burgess left the manuscript score of his symphony—inscribed affectionately to James Dixon–with the university, where it is kept in the Canter Rare Book Room of the Rita Benton Music Library. 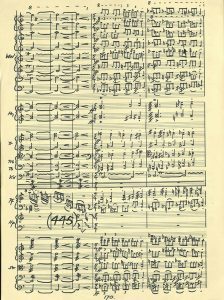 Whatever distractions the Christmas celebrations and airport muzak posed, they have left relatively few signs of distress in the score itself, which is written neatly in ink. 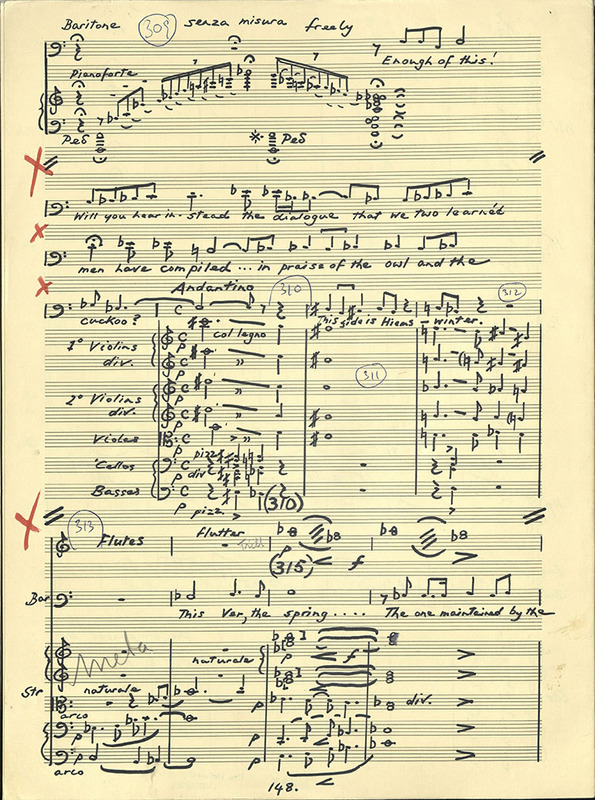 At one point Burgess lost or emptied his black pen, forcing an abrupt to switch to blue ink in the middle of the first movement. There are also some irreverent remarks printed in Arabic. Evidently proud of these idiosyncratic improprieties, Burgess referenced them in multiple commentaries on the symphony. As a whole, the symphony exudes an affable eclecticism of styles, somewhat akin to the spirit of Leonard Bernstein’s concert works. Also similar to Bernstein, the music’s charismatic appeal to listeners is balanced by substantive challenges for players. No one gets off easy. Large swaths of the work flicker with rapid activity, intense contrasts in orchestral color, and rhythmically intricate handoffs. As a result, players must execute challenging passagework under very exposed circumstances. Burgess may have thought he was writing a symphony, but the players are tasked with a concerto for orchestra. Burgess has the timpanist set the heart-quickening pace of the finale. Over the rattle of snare drum tattoos, clarinets pursue one another in imitative counterpoint until the rest of the wind section joins the frantic dance. Here and elsewhere, Burgess resists grand, monumental gestures, instead keeping the tone of the finale light and mischievous. Given the sheer musical interest—and fun—of the symphony, it is surprising the work is not better known. (The symphony remains unpublished.) Dixon’s own intention to release a professional recording with the UI Symphony is a plan that remains to be realized by a future director. I learned about Burgess’s Iowa Symphony from Theodore Ziolkowski’s Music Into Fiction: Composers Writing, Compositions Imitated, which music librarian Katie Buehner helpfully displayed on the new book shelf. I checked out the book because I liked the title and then placed it carefully alongside other well-titled books in my office. 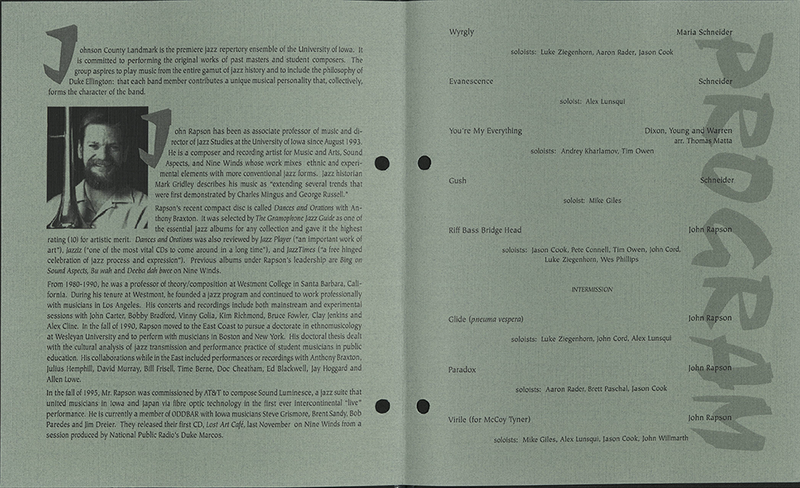 When I finally got around to opening it, I was surprised to find a reference to the symphony’s premiere at UI. A few searches in the catalog and further correspondences with Katie, Amy McBeth, and Christine Burke led to the printed program for the concert, Burgess’s manuscript score, and the university’s archival recording of the concert itself. Before seeing the score or hearing the recording, I was already hooked by Burgess’s program note, which introduced the symphony to listeners in terms that were alternately engrossing and endearingly self-deprecating. At this point, the story seemed to be taking me by the hand. Being the obliging sort, I followed. 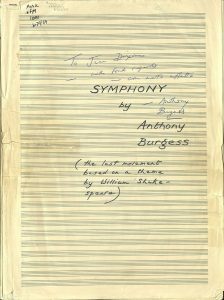 I studied Burgess’s manuscript full score at the staff work table tucked behind the patron counter at the music library. This setup was different from my visits to collections with devoted tables for researchers. In those spaces—such as the University’s Special Collections–researchers are set up with rare materials at a large table and left to commune with their selected sources. 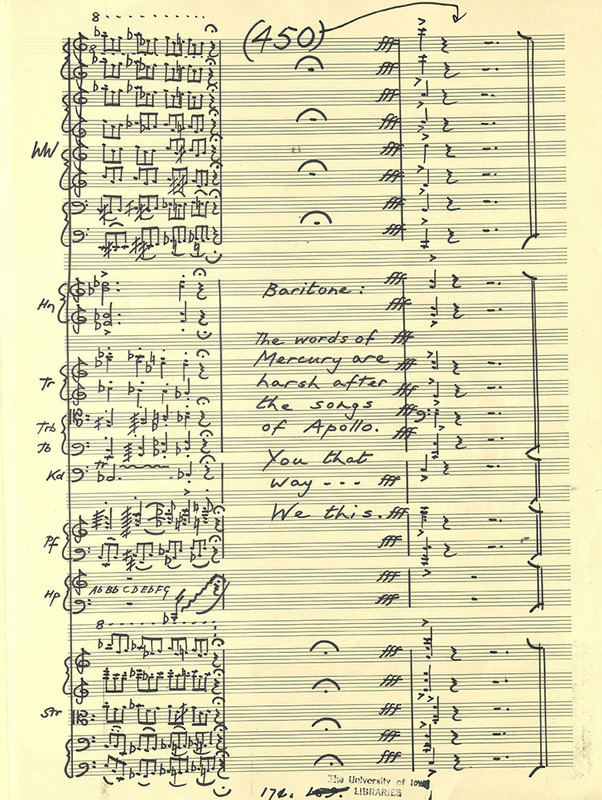 Score study of Burgess’s symphony, in contrast, was fit alongside the daily work of student staff. My encounter with Burgess’s music happened amidst the inner workings of the library itself, as students Alex, Anastasia, Ramin, and Shelby bound new music scores, loaded book carts, and helped patrons. I liked being close to these familiar rhythms, which reminded me of working as a student employee at the University of Michigan music library. That early experience of being surrounded by music and music scholarship had helped me find my way; UI’s music library offers similar opportunities today. 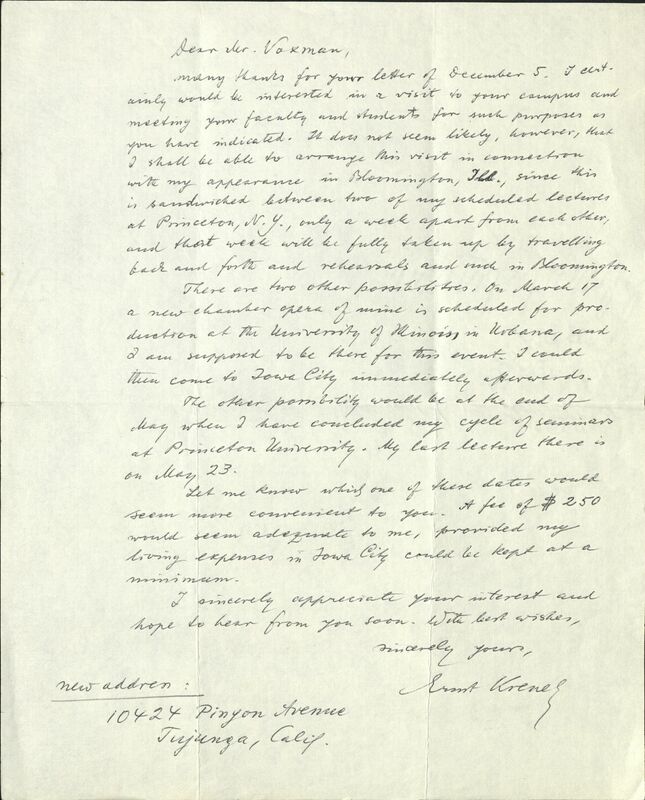 And it is not a stretch to imagine Burgess approving as well, knowing that his music for Dixon and the UI Symphony contributes to the curiosity-driven economy of research, by which music-making sustains and is sustained by the efforts of staff and librarians. Burgess would be pleasantly surprised to know that the recording of the premiere has benefited from the library’s care. “The work went on to tape,” he noticed, “to be blurred by the magnetic apparatus used in airport security checks, eventually to be snarled up or to wear out or to be accidentally wiped off.” While nothing material lasts forever, the university’s records of that special Iowa City performance are for now well kept at the Rita Benton Music Library, where ongoing efforts to enliven local history—including historic premieres by our student ensembles—provide current students with means to pursue music studies and designs of their own. Burgess, Anthony. “A Clockwork Orange Resucked (1986).” In A Clockwork Orange. New York: W.W. Norton & Co., 1962, 1986. Burgess, Anthony. “How I Wrote My Symphony.” New York Times. 28 December 1975, 73. Burgess, Anthony. 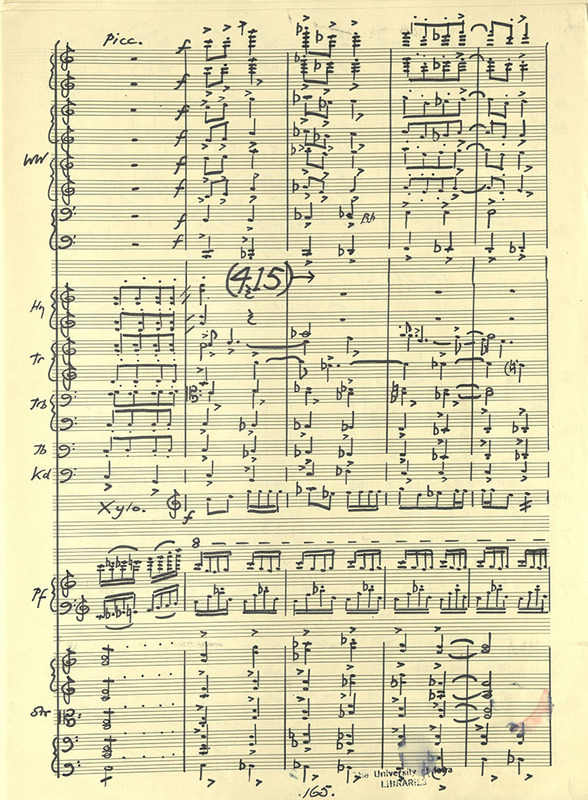 “Symphony in C.” Note published in the University Symphony Orchestra program. 22 October 1975. Cookie, Kevin. “Burgess as Teacher.” Daily Iowan. 31 October 1975. Phillips, Paul. 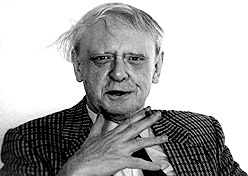 A Clockwork Counterpoint: The Music and Literature of Anthony Burgess. Manchester: Manchester University Press, 2010. Ziolkowski, Theodore. Music into Fiction: Composers Writing, Compositions Imitated. Rochester, NY: Camden House, 2017. Nathan Platte’s research and teaching interests include American film music, opera, collaborative creativity, and musical adaptations across media. He has presented papers at national and international conferences, including the Society for American Music, Society for Cinema and Media Studies, the American Musicological Society, and the British Library. His articles and projects have received recognition from the University of Michigan (Louise E. Cuyler Prize in Musicology), Harry Ransom Humanities Research Center (Dissertation Fellowship), the American Musicological Society (Publication Subvention), and Society for American Music (Mark Tucker Award and Wiley Housewright Dissertation Award). 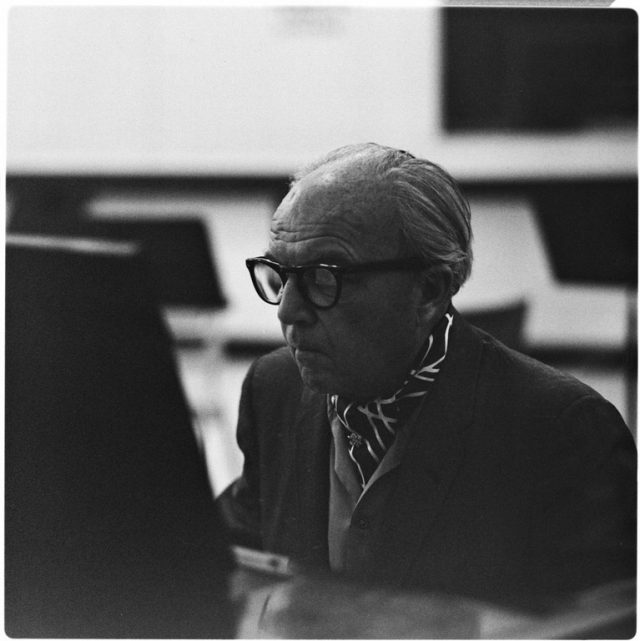 Platte’s publications explore film music of Hollywood’s studio era from a variety of angles, including the collaborative process of film scoring, the intersection of technology and music, the role of studio orchestras, and soundtrack albums. His articles have appeared in many journals, including The Journal of Musicology, 19th-Century Music, and The Journal of the Society for American Music. Platte’s work has also been published in anthologies, including Music in Epic Film: Listening to Spectacle (Routledge, 2017), where he contributed an essay on the Tara theme from Gone With the Wind, and Sound: Dialogue, Music, and Effects (Rutgers University Press, 2015), to which he contributed a chapter on production practices in postwar Hollywood. Platte’s books include The Routledge Film Music Sourcebook (Routledge, 2012; coedited with James Wierzbicki and Colin Roust) and Franz Waxman’s “Rebecca”: A Film Score Guide (Scarecrow Press, 2012; coauthored with David Neumeyer). 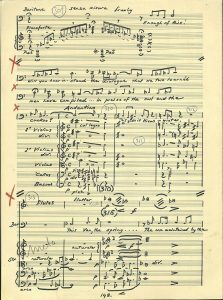 His most recent book, Making Music in Selznick’s Hollywood (Oxford University Press, 2018), investigates the scores for films like Gone With the Wind, Since You Went Away, and Spellbound. Platte received his Ph.D. from the University of Michigan, where he also completed bachelor’s degrees in history and trombone performance. Before joining the faculty at the University of Iowa in 2011, he taught at Michigan and Bowling Green State University. 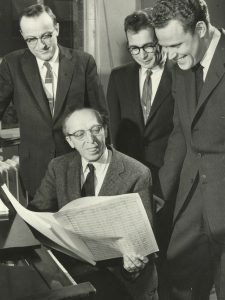 On March 5, 1958, Aaron Copland attended a concert by the State University of Iowa Symphony Orchestra as an honored guest. 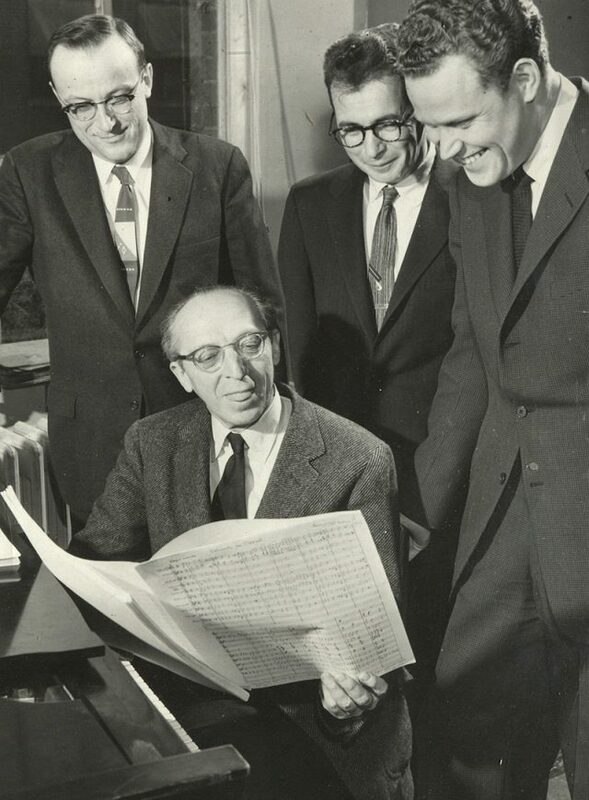 Copland’s visit, culminating in this performance, reflected as much upon Copland’s achievements as it did upon the achievements of American Music, and the musical achievements at the University of Iowa. Copland’s visit to the University was well received by students, faculty, and local residents. Attendance was at full capacity for the Symphony Orchestra concert as well as a lecture Copland gave titled “The Emergence of American Music.” In this lecture, Copland detailed that the “Emergence School of American Music” was “in the running,” implying that American Music could stand up to its European predecessors.1 This emergence that Copland referenced in his lecture is reflected in his own compositions performed by the SUI Symphony. 1 “Emergence School of Music In the Running: Copland,” The Daily Iowan, March 4, 1958, http://dailyiowan.lib.uiowa.edu/DI/1958/di1958-03-04.pdf. 2 Justice, Donald, “Chasing Billy- Copland’s Music- Pleases Audiences,” The Daily Iowan, March 7, 1958, http://dailyiowan.lib.uiowa.edu/DI/1958/di1958-03-07.pdf. 3 Perlis, Vivian, “The Tender Land,” Oxford Music Online, Grove Music Online, https://doi.org/10.1093/gmo/9781561592630.001.0001/ omo-9781561592630-e-5000905177. (accessed September 10, 2018). Oboist Jenna Sehmann is a performer and teacher currently located in Iowa City, IA. Ms. Sehmann serves as the oboe studio teacher at Cornell College (Mount Vernon, IA) and Mount Mercy University (Cedar Rapids, IA). 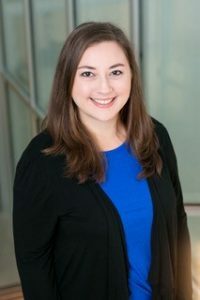 She is also the Teaching Assistant for the oboe studio at the University of Iowa, where she is pursuing her Doctor of Musical Arts in performance and pedagogy under Dr. Courtney Miller. On April 26, 2000, Johnson County Landmark, the premiere big band of the University of Iowa, featured the music of band leader, John Rapson, and award-winning American jazz composer, Maria Schneider. Programmed were three pieces from Schneider’s 1994 debut studio album, “Evanescence” – “Wrigly”, “Evanescence”, and “Gush”.1 Not only does the programming of Maria Schneider’s music display the jazz program’s commitment to a meaningfully well-rounded education in jazz history for student musicians and audience members alike, but to highlight her compositions is to underscore the diversity of American music and its infinite aesthetic possibilities. Maria Schneider remains one of the most prominent pioneers for women in jazz. In a 2016 spotlight interview for JAZZed magazine, Schneider affirmed that she has never seen her gender as being relevant in terms of her music.4 Regardless, one cannot deny that she holds a position as a prominent female role model in a male-dominated genre that jazz performers and listeners of all ages and genders look to as an example of originality of voice and cutting-edge musicianship at its finest. In a professional musical outlet where women are broadly marginalized, Maria Schneider is a true luminary for women composers and for anyone looking to test the boundaries of tradition. 1 Alexander, Peter. “Music by John Rapson and Maria Schneider will be featured by JCL April 26.” UI News Iowa City, Iowa), April 14, 2000. 2 Woolfe, Zachary. “Prairie Jazz Companion.” New York Times (New York, New York), April 12, 2013. 3 “No boundaries: A daring composer defies categories.” Economist (New York, New York), March 8, 2014. 4 “Maria Schneider – Music is About Life.” JAZZed (Las Vegas, NV), May 20, 2016. 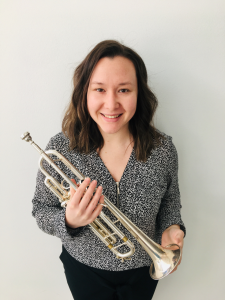 Toni LeFebvre, originally from Bettendorf, IA, is an active trumpet player and music educator. She completed her undergraduate degree in Music Education at the University of Northern Iowa in 2014. She was most recently the Band Director at Okoboji High School from 2015 to 2017 before moving to Iowa City to pursue a Master’s degree in Music Education at the University of Iowa, which she will complete May of 2019. In addition to her graduate studies, Toni has directed the Iowa City New Horizon’s concert and jazz ensembles, and is the co-founder and leader of the Iowa Women’s Jazz Orchestra, a big band comprised of women from across the state of Iowa which seeks to inspire young female musicians to find their voice in the jazz idiom. Upon completion of her Master’s degree, she plans to return to the field of public education as a high school band director in Iowa. Check out a profile of Toni in The Daily Iowan from March 11, 2019. Can works composed in the United States be considered American if they draw on European styles? When does an immigrant – and his art – become American? 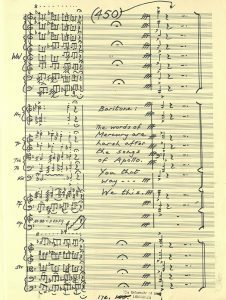 The November 17, 1965 University Orchestra program offers one opportunity to consider how these questions can be navigated. 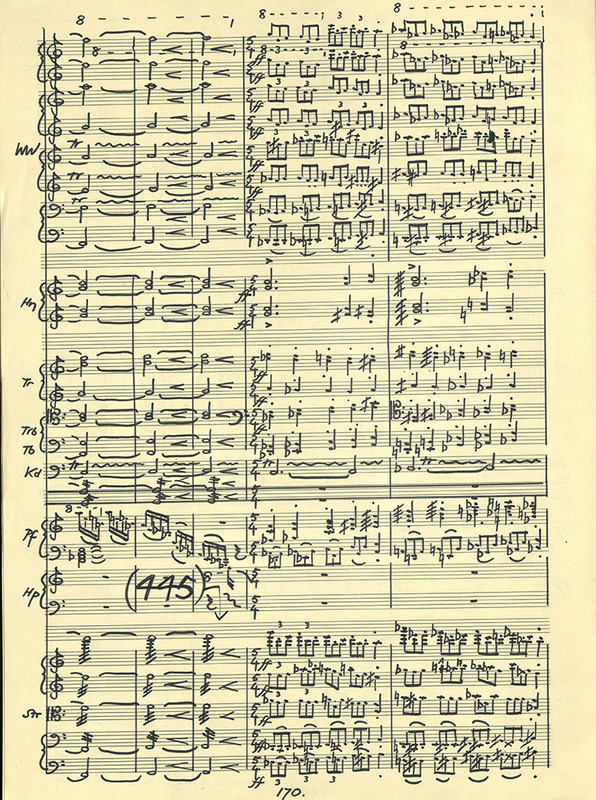 The program notes for his Symphonic Elegy, In memoriam: Anton Webern (1946) present Austrian-born Czech Ernst Krenek (1900-1991) as an American composer.1 His American citizenship is emphasized, noting that the piece was written in St. Paul, MN, nine years after Krenek’s emigration. However, William Pepper, the program notes’ author, unifies the four pieces of this program by appealing to European dynasties of composers. Pepper notes that while Mozart and Beethoveen are considered members of the First Viennese School, Webern was part of founding the Second. As Webern’s student, Krenek was a direct descendant of the Second Viennese School.2 By framing the program in this way, Pepper emphasizes the way that programming at the University of Iowa during the late sixties involved experimentalists without straying too far from canonical giants. Krenek’s association with the European tradition of art music give his music prestige, but he is still claimed as an American composer. 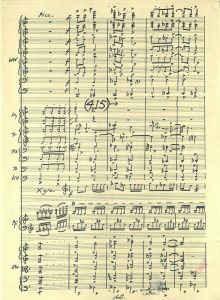 Here, his Americanness is legitimized by subtly emphasizing his flight from oppression in Nazi Germany.3 Pepper notes that Webern was killed in Germany when he exited his house after curfew, further emphasizing the political priorities that loomed large in the American mind of the 1960s. These program notes seek to establish Krenek’s piece as both the product of American freedom and the heir of the great Viennese masters. 1 Charlotte Purkis, “Krenek [Křenek], Ernst.” Grove Music (2001) https://doi.org/10.1093/gmo/9781561592630.article.O902602. 2 William Pepper, “Program Notes,” University Symphony Orchestra, Second Concert, 1965-66 Season. 4 Ernst Krenek, Krenek to Himie Voxman, undated, in Himie Voxman Papers, Rita Benton Music Library, University of Iowa. Lisa Pollock Mumme will finish her M.A in Musicology at the University of Iowa in Spring 2019. 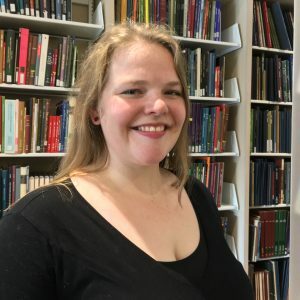 Lisa studies gender and music, specifically in film music, with a secondary interest in the performing bodies of nineteenth-century Latin American opera world. Lisa’s work in film music focuses on gender in genre film, with particular attention to dystopian works. Lisa’s thesis on the Mad Max franchise located a site of embodied resistance for one disempowered character in her diegetic performance of her own theme, and defined competing musical forces that simultaneously masculinize and feminize subsequent characters. Her secondary area of research concerns the nineteenth-century Mexican opera singer and composer Ángela Peralta. Lisa plans to develop both facets of her research as a PhD student next year. Starting on March 31, 2017, the School of Music will host three Collage concerts celebrating the opening of the Voxman Music Building at 93. E. Burlington St. “Coming Home” is the theme of the year, especially for the many alumni who have journeyed to see the new space and hear music fills its halls. Historically, the University of Iowa School of Music has often grappled with the concept of “home,” especially since the program has spent only 37 years of a 110+ year existence in a centralized location. 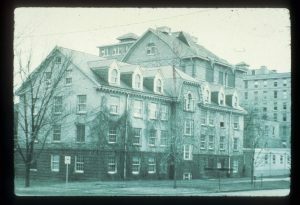 When the School of Music, Affiliated was established in 1906, it occupied space in what became Unity Hall (close to present day Phillips Hall). However, faculty studios were also in homes and ensembles rehearsed in MacBride or the Armory (near the current English Philosophy Building). In its second year, the school took over space in the Dey Building across from Unity Hall on the corner of Iowa and Clinton. These are not “frills” but crying needs…I cannot omit to point out that developing a department of music under present conditions is almost like building a house without tools. Certainly a ten years’ delay would stifle all growth! 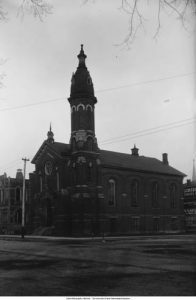 By the 1930s, Clapp felt the School was reasonably well served by its facilities, especially with the addition in 1931 of what became known as the “School of Music Building” on the corner of Gilbert and Jefferson. In 1954, Clapp stepped down as director and was succeeded by Himie Voxman. Documentation shows that Himie started advocating for a new building early on in his tenure as Director. It was time for the Department to teach, practice, learn, rehearse, study, and perform under one roof. 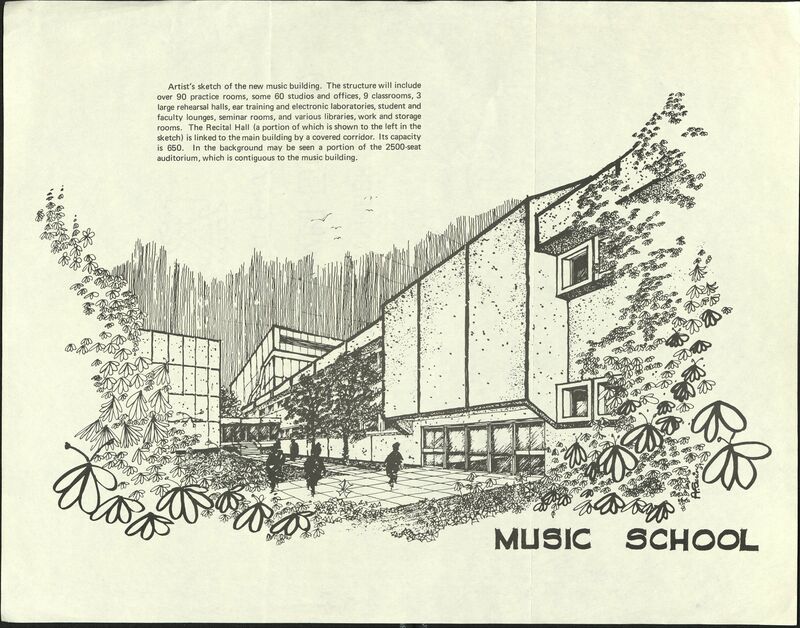 rendering of the School of Music Building, late 1960s. 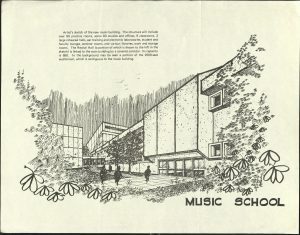 In 1968, it was announced that a new fine arts complex would be constructed on the west bank of the Iowa River to house the School of Music and several other arts venues. The state supplied 2.7 million and several federal grants totaling 1.5 million funded the School of Music portion, though the entire complex would end up costing around 11 million. Architect Max Abramovitz (New York) designed the complex, which included a 700-seat recital hall named for P. G. Clapp, a 200-seat hall named for administrator Earl Harper, and a large 2,5000+ seat performance space that would be named in memory of UIowa president Virgil Hancher. The School opened in 1971 and Hancher Auditorium rolled out the red carpet in the fall of 1972. A headline in the Iowa Press-Citizen read, “Makeshift Days Ending at Iowa School of Music” – for the first time in its 60+ year history, the School had a place to call home. Most awards and honors are destined to be placed on the lapels of jackets, hung on walls, displayed on shelves or, in some cases, deposited in banks. I believe my honor is something special. It is so great and so significant it can only be worn in one place – my heart. 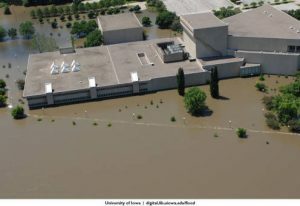 The 2008 Flood of the Iowa River ended in tragedy for the Voxman Music Building. Deemed a loss by the Federal Emergency Management Agency (FEMA), the Voxman Music Building was razed in 2013 with plans for a replacement facility launched in 2009. Over the next eight years, the School occupied over 20 different campus and community buildings in order to supply studios, office, practice rooms, classes, rehearsal and recording spaces, performance venues, and library services. After much discussion, the decision was made to separate Hancher Auditorium and the School of Music, the latter of which returned to a mere three blocks south on Clinton Street from its first home in Unity Hall on Clinton and Iowa. In August 2016, the School of Music moved into its new home on the corner of Burlington and Clinton in downtown Iowa City. The 184,000 square foot building includes a 700-seat concert hall, 200-seat recital hall, organ recital hall, rehearsal rooms, the Rita Benton Music Library, practice rooms, classrooms, studios, offices, and a student commons. More importantly, it houses all of the faculty, staff, and students of the School of Music under a single roof, right in heart of Iowa City. Be sure to check out the “Building a School of Music” exhibit, which will be on display from April-July in the first floor hallway case located outside of the School of Music offices and across from the Rita Benton Music Library. On Wednesday evening, the University of Iowa Symphony Orchestra and Choirs will perform Gustav Mahler’s Symphony No. 2 in C minor-E flat major, “Resurrection”, marking the first School of Music ensemble performance in the new Hancher Auditorium. The selection of this work is a powerful reminiscence for many, as it was performed during the opening weekend of the old Auditorium in 1972 under the direction of James Dixon (UI Symphony Orchestra Director, 1962-1997). For that performance, the Orchestra was 141 players strong and included many faculty players: Bill Hibbard, viola; Eldon Obrecht, bass; Tom Ayres, clarinet; Ronald Tyree, bassoon; Paul Anderson, horn; Delbert Disselhorst, organ. Kathryn Harvey (soprano) and Janice Roché (mezzo-soprano) were the vocal soloists and the choirs totaled 197 singers. All in all, that placed over 325 performers on stage. 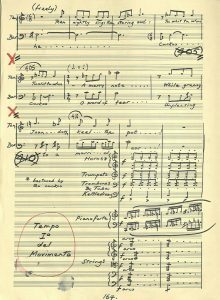 There were two other works performed on the concert; Brahms’s Academic Festival Overture and a world premiere work by Charles Wuorinen, Grand Bamboula for String Orchestra. 2. Andante moderato. Sehr gemächlich. Nie eilen. This was not the first time Mahler’s Second Symphony was performed at the University. In 1942, Philip Greeley Clapp (School of Music Director, 1919-1953) led the University Orchestra and Choirs in the work. 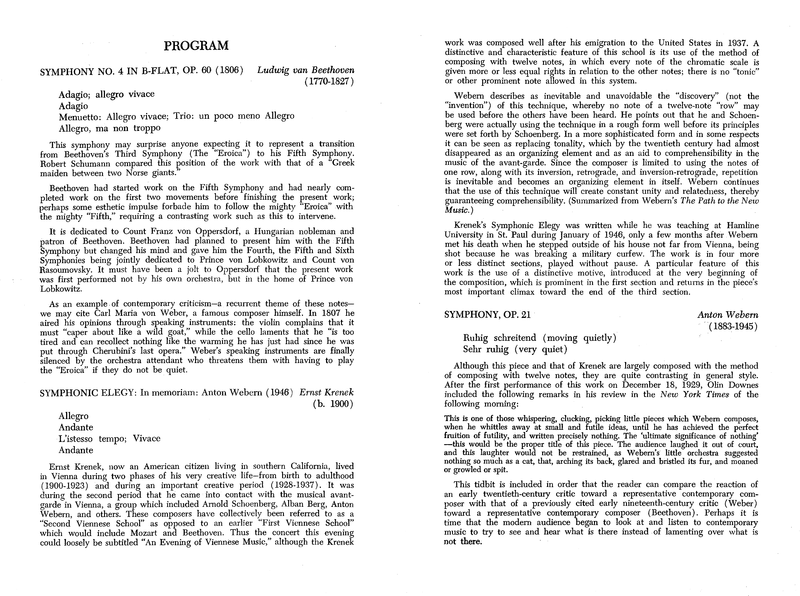 The 1972 program book reprinted a segment of Dr. Clapp’s program notes for this concert, which were then augmented by student David Lasocki. “It was a great moment in the lives of the 2,680 audience members – being part of the opening of Hancher Auditorium. 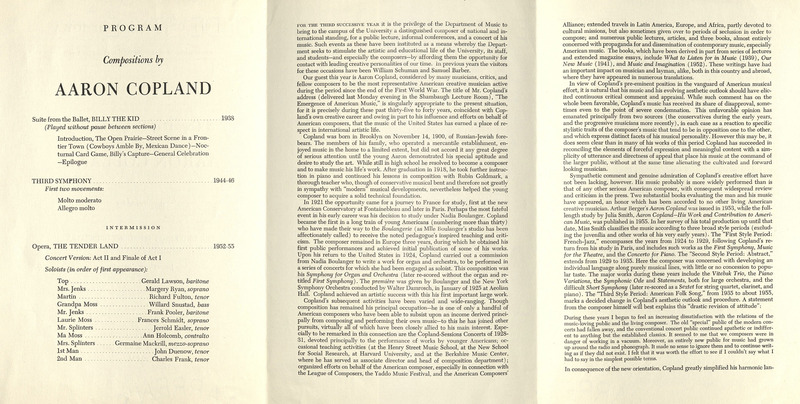 The brilliance and magnificence of the evening of September 30, 1972, will make the future years of culture in Iowa more memorable, more meaningful, and historically significant as a ‘new beginning’ for the arts of the midwest,” concluded The Daily Iowan. Now in 2016, 1,800 audience members will have the opportunity to relive that historical moment while creating one of their own on September 28th. 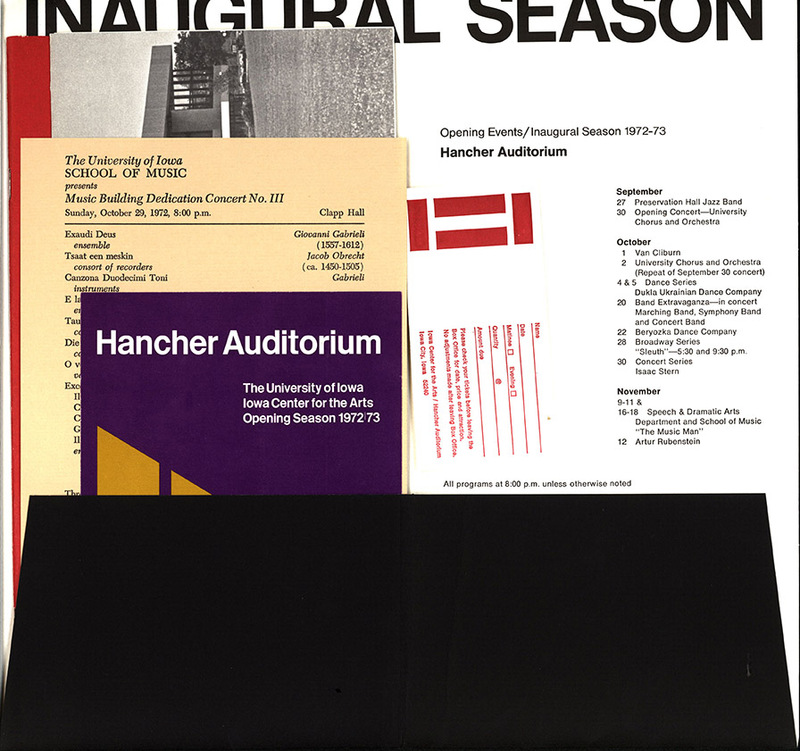 This packet of materials contains a brochure on the new Hancher Auditorium, a quick facts sheet on the hall’s architectural features, a program for the opening concert and the School of Music Building’s Dedication Concert, and two (used) ticket stubs. Donated to the Rita Benton Music Library by Dr. Frederick Crane.